See in Glossary are not included into the game data. See the Graphics window if you want to override this behavior. See in Glossary to help solve that. See in Glossary, and for each of them, a list of Pass types and shader keyword combinations to load. 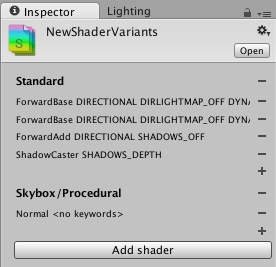 To help with creating these assets based on actually used shaders and their variants, the editor can track which shaders and their variants are actually used. In the Graphics window, there is a button to create a new ShaderVariantCollection out of currently tracked shaders, or to clear the currently tracked shader list. Once you have some ShaderVariantCollection assets, you can set for these variants to be automatically preloaded while loading the application (under Preloaded Shaders list on the Graphics window), or you can preload an individual shader variant collection from a script. The Preloaded Shaders list is intended for frequently used shaders. Shader variants that are listed there the are loaded into memory for entire lifetime of the application. This may use significant amount of memory for ShaderVariantCollections assets that include large number of variants. To avoid that, ShaderVariantCollection assets should be created at smaller granularity and loaded from a script. One strategy is to record used shader variants for each scene, save them into separate ShaderVariantCollections assets and load them on scene startup.